Wow, good job Elmo! I was slightly tense as i read this since the possibility of messing up seems rather high. Have a great 4th of july! 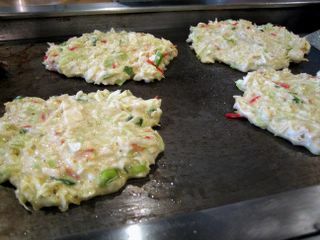 I didn't know they had restaurants specializing in okonomiyaki, where they let you make it yourself. I am familiar with the dish, though. 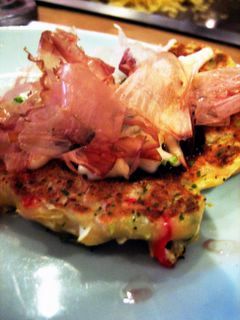 I make a pretty mean okonomiyaki. My Japanese friends all say it tastes like the real deal. And I get it often at the food court at Mitsuwa Marketplace. (Which is literally next door. So I have it often.) I think I'll go get some for lunch today. yay you got to try gaja okonomikayi! i've gotta give you props for separating your okonomiyaki into smaller circles--that was smart. 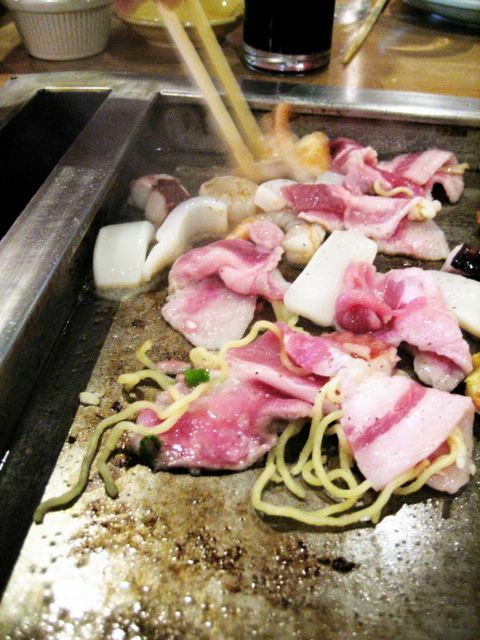 you already know that i learned the hard way (as did your friend) with trying to flip one big ghetto-nomiyaki. but as you said, at least it tasted good! great report as always! I won't get you for being anonymous. Unless, of course, you leave me hit and run posts about tubers. LOL! I was planning to make okonomiyaki myself at home but couldn't find all of the ingredients that Kirk put into his recipe. So I did the next best thing! And now that you mention it, I have seen that Korean pancake which is similar. I've definitely seen it on menus but haven't ordered it, not knowing that it is cut from the same cloth. Will need to try it now. I think separating it into those small circles was an act of wimpiness by me. I decided that I've leave it for my friends to decide if they wanted to attempt to make a big one. And of course, as I predicted, your ghetto-nomiyaki made an appearance! I knew it was you all along. OK, well not really, but I knew it was someone who knew Japanese food well, and had my bet it was you. But I did kind of set my friend up with the more complicated order. But she set herself up by making the big pancake! I actually asked her "are you sure you wanna do that?" To which she said "why not?" To which I shrugged and said "okaaaay." Great pancake flipping skills Elmo! I agree with Pam, it was a great idea for you to make mini-servings. That way, the pancakes cook faster, and are easier to handle. This just further confirms that you would be a great Food Network host. I like posts when you cook! Edwin, very nice posting. As with all of your posts, I feel like I'm right there biting my nails in anticipation for the formidable belly-flop haha. 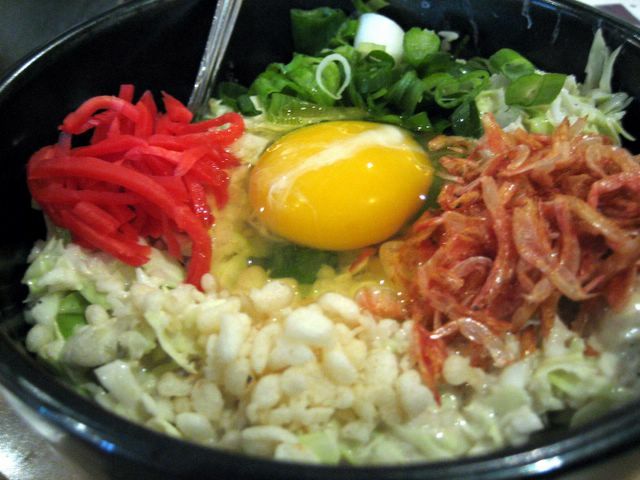 When I was in Japan, people were crazy over the Takoyaki octopus balls, but I preferred the Okonomiyaki b/c it had eggs, tons of katsuoboshi flakes and green onions. The food looks great and I'll definitely come here to try it out. Hey thanks! This post qualifies as a cooking post doesn't it? It just occurs to me that I haven't posted anything cooking related since last year. Two birds. One stone! Actually I'm surprised you haven't tried this place yet. It probably wouldn't have been quite a schlep from LA as it was from Irvine. But then I cheated, it was Sunday night...traffic was as light as it ever gets. Whoa! I'm not fond of this dish as EDnbM will attest to, but yours does sound delectable! Glad that you had a great 4th (or 3rd) of July! Next time I drive through the OC, maybe we can meet up for some ONO Hawaiian eats too! Hi elmo. I'm glad I found your site. I used to go by "Gonzo" on Chowhound. Now I'm Pirikara which means spicy! I just posted a lil thing bout gaja. I went on a sunday evening too. Definitely warm in there but still tolerable. You're in for a treat. For some reason, OC's has a lot of new Hawaiian places opening up. I had the best chicken katsu ever at one just recently. Welcome to my blog! Judging by your GaJa post, you look like a pro. I am but a noob! I was going to compare the experience to being a chicken on a rotisserie, but then I knew someone was going to ask "Where'd they shove the skewer?" There's a good desert place in the same center, to the left of Gaja - Patisserie Chantilly. They only make limited numbers of fresh deserts daily, so get there early for the good stuff.